Is outsourcing healthcare back-office support on your mind? Then you need the help of specialists like us to take care of healthcare functions such as medical coding, billing, revenue cycle management (RCM), denial management, account receivable management, insurance verification, and much more. A host of functions that are part of healthcare back-office support can eat into your time and disturb your productivity. If this is your concern, Outsource2india can come to your rescue. By leveraging the know-how of healthcare's backbone and the administrative process that accompany the system, we have formulated a unique solution that is not just intuitively designed to cover all key areas of revenue cycle management but also to relieve physicians and back-office teams to focus on other important objectives. Outsource2india's healthcare back-office support for physicians is a service handled by certified professionals to streamline RCM processes such as patient eligibility checks, scrubbing claims, claims filing, charge capture, payment posting and much more. Our goal is to improve your cash flow and quicken the TAT. Ensuring the accuracy of billing data such as start and end term of the coverage, co-pay data, member ID, group ID, etc. Being an expert at medical transcription we have already handled many projects involving medical transcription services for physicians. 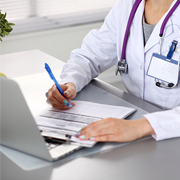 With a short turnaround time, we have an established reputation as a reliable physician transcription services provider. O2I provides high-quality analytics services that will streamline physicians' tasks by improving the service efficiency and risk management abilities. Our analytics services are aimed to minimize the risk faced by physicians in coding and billing process. Insurance billing forms such as UB-04 (1450), HCFA 1500, etc. We capture patient demographics such as the patient's birth year, gender, postal code, blood type, and ethnicity to identify and categorize patients for statistical analysis. In a healthcare back-office support project umpteen functions exist that do not require the involvement of knowledge workers. We use automation tools to take care of labor-intensive tasks without additional cost. I am very impressed at the ease, quality, and the speed of the dictation service. Bernard (Sales Manager) was always professional & prompt with replying. I would highly recommend this service to my clients and colleagues. I am very happy with the quality of the dictation work & look forward to working with Outsource2india in the future. With 20 years of deep industry experience, we at Outsource2india, provide the best medical billing & coding services. We follow HIPAA compliant medical billing process and ensure that you receive quality back-end support service at an affordable rate. Our professionals are skilled in various specialties of healthcare back-office support. By leaving us in charge of these tasks you can focus on other functions that need your attention. We strictly adhere to the compliances and meet the deadline agreed by the client in the SLA.